Have you ever needed help finding health care, government resources, mental health care, or activities to do in your community? The BeWell Community Guide is a great place to start! 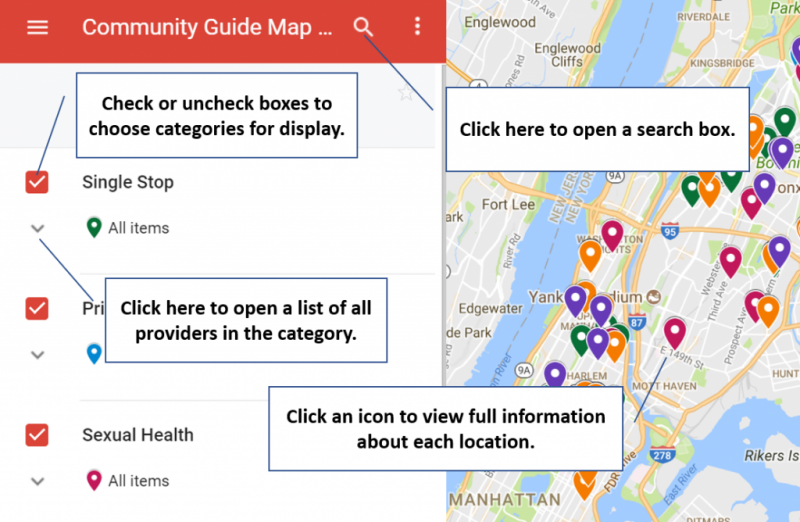 In this guide, you’ll find a number of community resources that are important for people of all ages in the Bronx and Manhattan to know about. We’ve created a map that is filterable and searchable, which makes searching for resources and getting directions to any location easy. The BeWell Health & Wellness team handpicked these resources to make sure you have access to the best care out there. Read on to learn more about the different resource categories available on the map. Primary care is day-to-day healthcare done by a medical provider, such as a doctor or nurse practitioner. Services include physicals, check ups, sick visits, and vaccinations. In New York State, minors can self-consent to confidential/private sexual health services; this means adolescents don’t need permission from a parent or guardian to receive these services. Mental health includes our emotional, psychological, and social wellbeing. It affects how we think, feel, and act. Counseling and therapy with a mental health professional, such as a social worker, can help you manage your feelings and relationships. Recreation is an activity you do to have fun! This could be playing sports, creating art, listening to or making music, reading, being on a leadership committee, or using computers. Rec programs for teens provide a safe place to have fun with others. Farmer’s markets sell the freshest, most nutritious locally grown food. Seasonal, delicious fruits, vegetables, dairy products, and eggs are some of the fresh, healthy foods you can find at the Farmer’s Market. Youthmarket Farm Stands are operated by NYC youth. We sincerely hope that this resource guide will benefit the lives of you, your family, and your community. If you need additional help finding or accessing resources, contact BeWell through our online form. Click to access our map of community resources, which can be customized as described below.